Developed by Gary Gauger using his RIMS system, there were three versions of this kit. 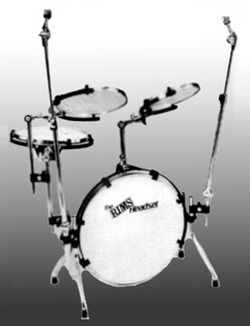 The first two versions used Remo PTS pre-tuned heads and left a fair bit to be desired, especially in the bass. But eventually the third and final NE Series was released enabling the use of any type of head, paving the way for optimisation. They originally came with clear Evans CAD/CAM single ply clear heads, and the sound was too thin. Also, clear heads also made the kit look less credible from the playing side as well as the audience point of view. In the end, I found that Evans Hydraulics are a perfect choice. They avoid the nasal, shouty quality of clear single ply heads, while adding back some of the depth and body of a traditional shell. You will see many cyber-comments that say these are somehow not good enough for gigging, and I agree - except for the NE series, with the double ply heads. They do sound different, but certainly not 'worse'. Tuned low, they mic up beautifully and I use them this way for practice, recording and mic-ed up live. For unplugged live use, I tune them higher where the extra tone, resonance and bite help the dynamics and the mix. Sizes are 10", 12", 14" and 20". I have the original clear Evans CAD/CAM heads, but it looks and sounds so much better with solid heads. I chose black because I think it goes with the hi-tech feel and I chose hydraulics because for recording and home use I tune them as low as possible. I have restored the kit and it is now in almost as new condition, so this is not a budget option - it is in beautiful condition and will be a keeper since as time passes, equipment lessens - right? The kit is shown set up as intended with everything hanging off the bass drum which offers maximum portability but by far the best way to set it up is with the toms hanging from cymbal stands, fusion-style. Please notice that even though space is saved for transportation, the footprint once set up is identical to a regular kit.